Out on the almost-still water, warmed by the sun, braced by the fresh breeze and soothed by the little boat’s gentle rocking, memories of winter are quickly fading. An elegant tern glides by, living up to its name. But today we are looking for something else: Sea turtles, specifically green sea turtles and the beautiful, highly endangered hawksbills. Reason # 1 Sea Turtles! Any species that has survived for over 100-million years, even predating the dinosaurs, deserves respect! When the last of the giant reptiles died 65-million years ago, sea turtles were already the ocean’s senior citizens and going strong. As humans evolved, sea turtles were part of the way our ancient grandfathers explained their existence. Sea turtle carries the world in the Hindu tradition, it saved the other animals from the flood in the native America Ojibwe tradition. 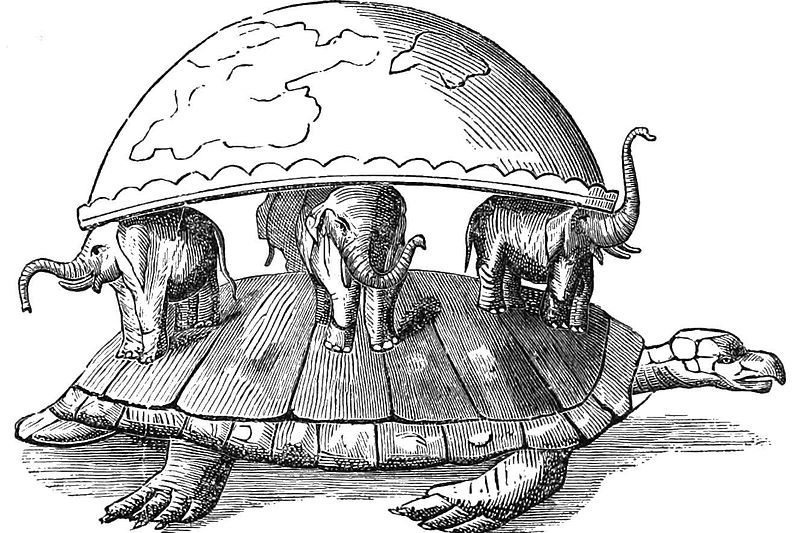 Sea turtle is a trickster for the Yorba in (Nigeria, Cameroon and Benin) Africa, but in China, they stand for endurance and strength and represent the four directions of the compass. 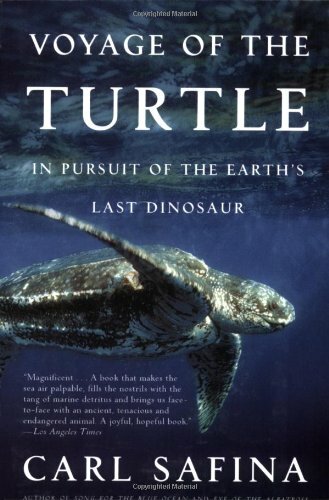 All over the planet, sea turtle played a central role in ancient cultural life. Size, Attitude, Perseverance, Sea Turtles are Amazing! Perhaps our reverence began with their size, leatherbacks can reach up to 2,000 pounds (225-900kg), or on their habit of disappearing into to the sea as tiny hatchlings and reappearing as adults to nest years later on the same beach. 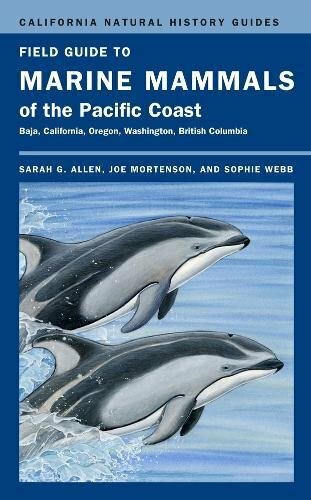 Or perhaps we respective the way they haul their enormous bodies out of the water and up the sand, ignoring every obstacle in their way, to lay hundreds of eggs at a time, trusting only the sand to protect the next generation. Or maybe we admire sea turtles for where we have found them, at great distances and amazing ocean depths. Then again it might be the incongruence of the species itself. While other sea life gracefully glides through the water in a vast undersea ballet, determined sea turtle barrels headlong, flippers propelling their rigid, unyielding bodies through the water. Sea turtles are amazing. Over the millennia sea turtles evolved into the seven species we have to today: Leatherbacks, Loggerheads, green sea turtles, Hawksbills, Olive ridley, Kemp’s ridley, and flatback. Although they used to be so numerous that lost sailors followed great swaths of migrating turtles – today all but a single species is endangered. Sea Turtles Live in Beautiful Places. This knows how to live! Sea turtles have staked out some of the most beautiful places on earth as their habitat. Perhaps the ancients were right, this is a wise species: no freezing polar regions for them. 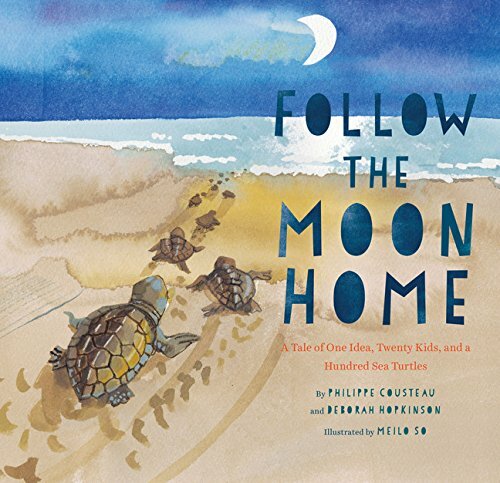 You will find sea turtles where the breeze is soft, and the sand and sun are warm. They choose the planets most amazing places to rest, feed and nest. That means to help them you too must travel there. One of those amazing places is Magdalena Bay, Baja California Sur, Mexico. Out on the Bay, our guide points to a dark patch on the water just a few meters away. Suddenly, the energy level on the little boat spikes. The green sea turtle's 40-inch length (one meter) is almost invisible to our untrained eye, but with its appearance, the action begins! We will help to net it and bring it to shore. There we will assist in weighing, measuring and collecting other data. Afterward, we carry the turtle back out into the bay and release it into the sea again. Later in the week, we will visit a turtle hatchery. Yes, that Citizen Scientist contributing to the world’s knowledge base is you! 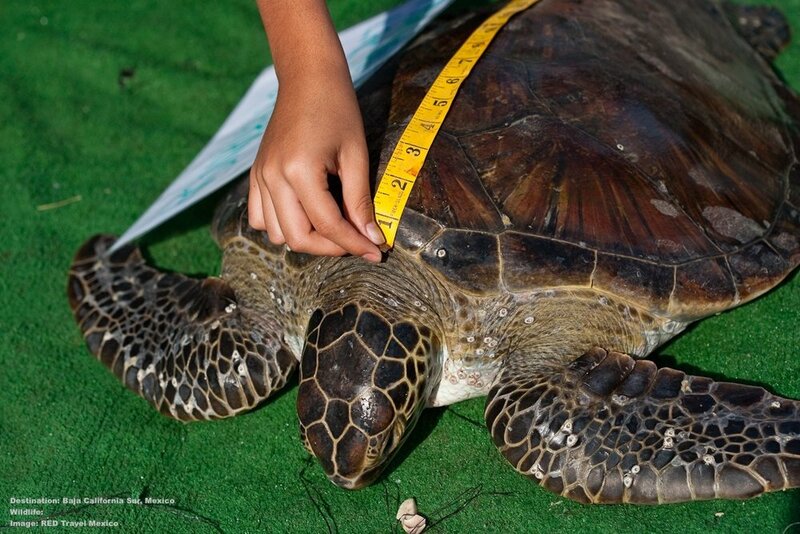 LOCAL VOLUNTEERS RESCUE TURTLES, LIKE THIS HAWKSBILL, CAUGHT IN FISHING LINE, TOO. THEY WILL COLLECT ITS DATA AND RELEASE IT. IMAGE THANKS TO RED TRAVEL MEXICO. 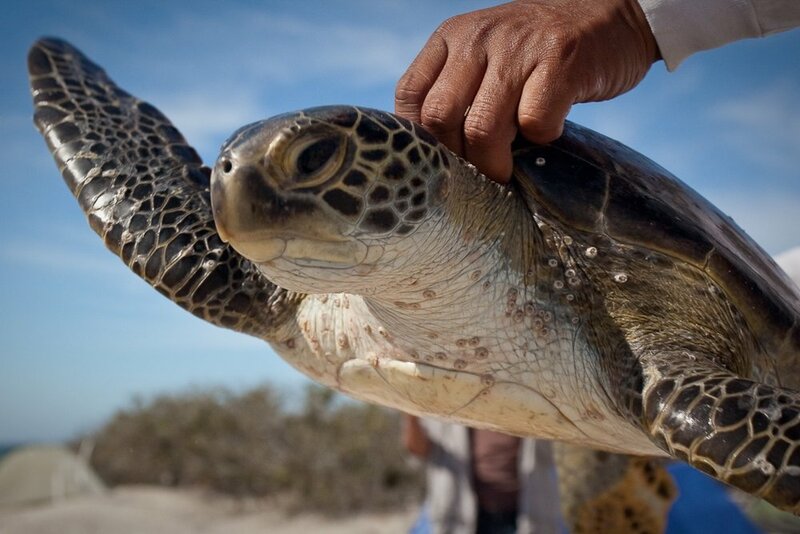 Green sea turtles don't breed at Magdalena Bay, they come here to feed in the gentle waters. The Bay is protected by the barrier islands of Isla Santa Maria and Isla Magdalena. Its calm, soothing water is an oasis for the green, the black (a sub-species of the green), loggerhead, olive ridley, and the beautiful hawksbill sea turtles and also for many other marine species including both the ever-curious dolphins and migrating grey whale that have already announced their presence. 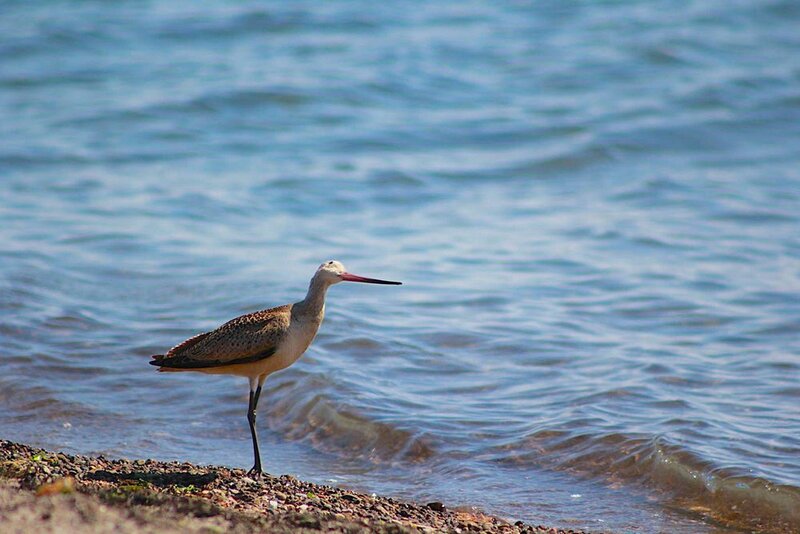 But exploring Magdalena Bay is more than a pretty day on the water. It's mangrove canals are teeming with bird life: curlews and oystercatchers, plovers and sandpipers, marbled godwit, great blue heron, reddish herons, yellow-crowned night herons, tri-colored herons as well as cormorants, and pelican are all regulars. Warblers winter here and even bald eagles have been seen. All over the world, local people are rising to the challenge of halting the decline of sea turtle populations. Whole communities have united to clean and monitor turtle nesting beaches, catch the enormous animals in order to collect data like weight, measurement, gender, and health. Some put tracking devices on them, others hold sea turtle festivals to raise awareness and promote turtle tourism as an economical alternative to turtle harvesting. 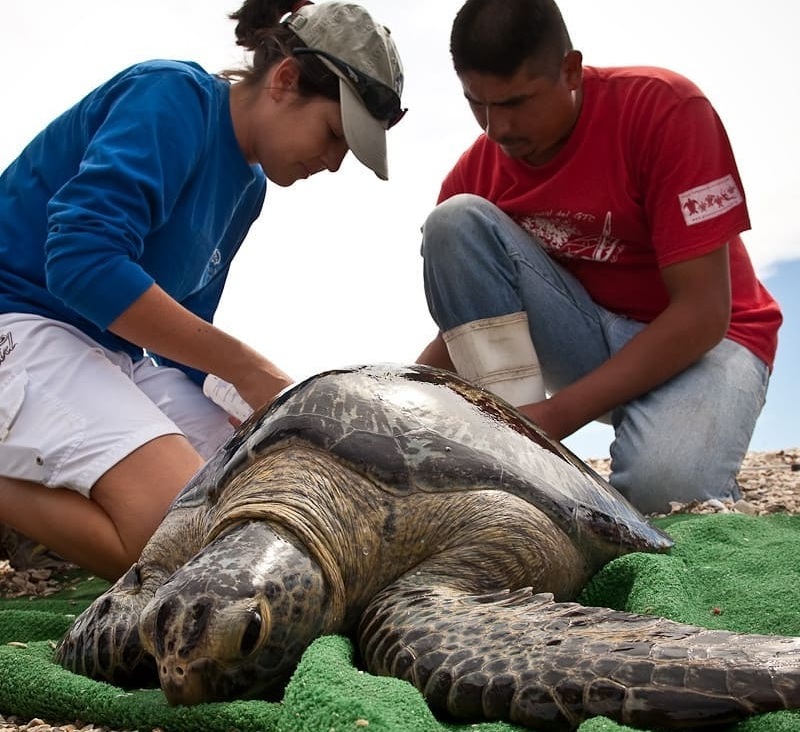 At Magdalena Bay you’ll get the chance to work with the local conservation groups which includes local scientists, fishermen, students and other, mostly volunteering, locals. An important part of the conservation effort is the sea turtle eco-tourism that brings money to the economy and makes the turtles more valuable alive than as soup or jewelry - or thrown away, dead after being caught in fishing line. 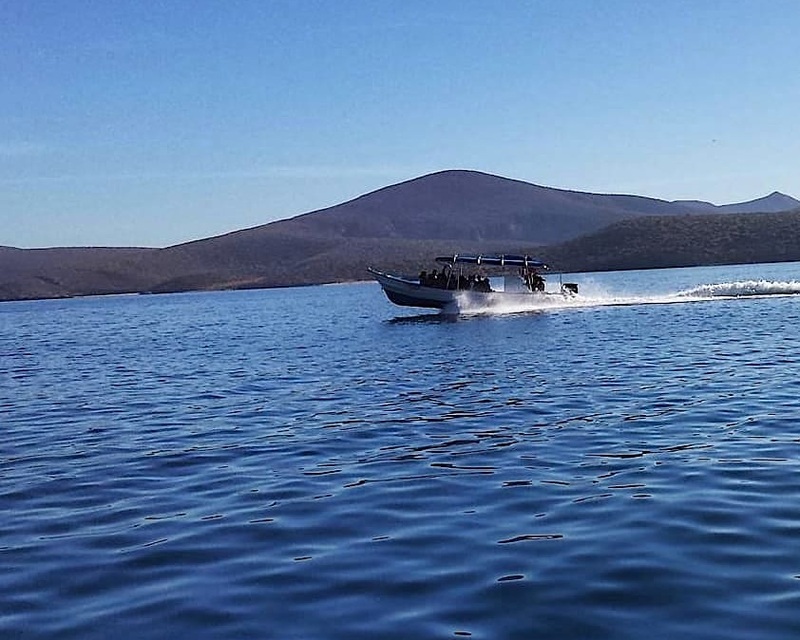 At Magdalena Bay you are part of the action, the fun and the conservation solution. Great Solo Travel with a Twist. Like to travel solo? A turtle volunteer trip is an excellent holiday for solo travelers. Open your world. Discover skills you never knew you had, connect with nature and wildlife - and other like-minded people - in ways you didn’t think possible. And it’s fun! Just ask, and we will make sure that you are traveling with like-minded adults, not on a family holiday. Or put together a small group of friends for an extraordinary vacation. Pick a date, and we will plan one for you. There is something very special about sleeping on the beach in a cozy tent surrounded by black velvet and a galaxy of stars. In front of your tent the beach glows with moonlight and sparkles dance on the rippling bay. The water softly lapping lulls you to sleep – when you can finally pull yourself away from the sky. If the mention of a “family vacation” causes your pre-teen or teen to suddenly look like you just gave him or her bat guano for lunch, you are not alone. Take them on a sea turtle volunteer holiday and watch what happens. Somehow that same teen who blithely steps over piles of laundry on his floor, hasn’t willingly walked the dog since 2010 is ready, and believes the trash takes itself out, is ready – no elated – at the chance to help haul a 300 lb. turtle on board a little boat. Worried about keeping the kids focused? Working with the young local conservationists has turned many a science obverse student into a naturalist, much to the surprise of their teachers back home. And did I mention there is the opportunity for kayaking, snorkeling with a whale shark, spying grey whales spy hopping, sand-sliding down a sand dune and you get to sleep in a (really comfortable) tent on the beach, too? Are you sitting down? Kids have been known to put their phones away for hours or even days here. In between corralling sea turtles for data collection and visiting the hatchery, there are whale sharks on our agenda. The slow-moving, plankton-eating, whale sharks feed near the surface. Either snorkel with the biggest (and possibly most laid back) fish on the planet or decide to stay on the boat. Either way, once you have encountered your first, you may be hooked by whale sharks. 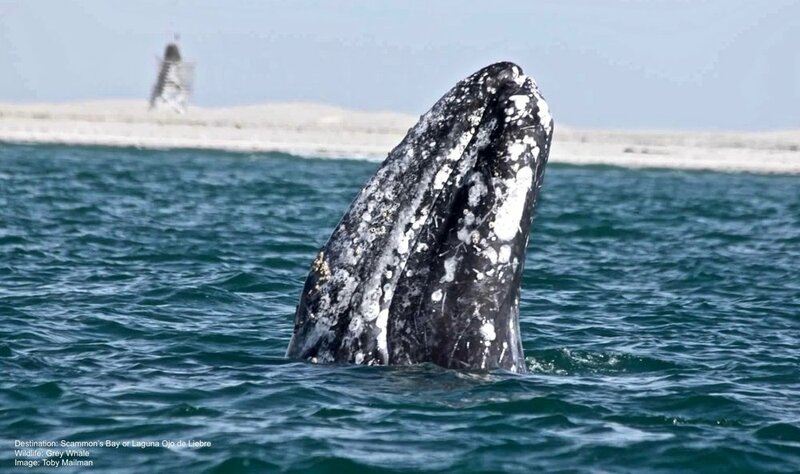 This Bay is famous for their “friendly” grey whales, too The same whales that avoid all contact while migrating to and from the waters off Alaska regularly approach the panga boats in Magdalena Bay for an introduction. We will get a (hopefully close-up) look at grey whale calves when they come for a look at us. A “must-see” at Magdalena Bay is the unusual volcanic-formed island EspirÌtu Santo. 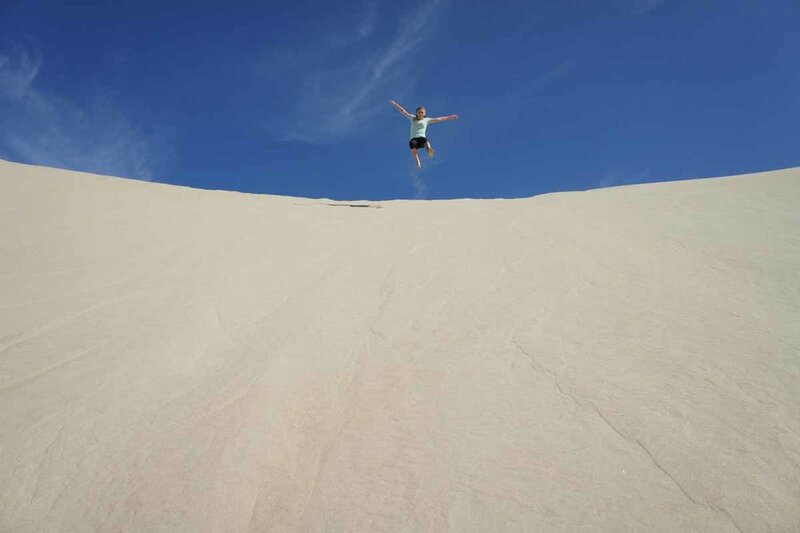 The island, a mix of rock and sand dunes, was saved from development as a resort/casino in 1990 by a coalition of concerned citizen-activists from Mexico and the United States. The Nature Conservancy joined the fight, and an anonymous donation to the World Wildlife fund enabled the alliance to purchase the island. In 1995, UNESCO declared the island a Biosphere Reserve. Sea lions breed here, birds abound, and you might even catch sight of a black jackrabbit, this is their only known habitat. The sand and water are pristine. You may never want to leave. This turtle volunteer holiday has a (small) city-side too. Spend evening to explore the lovely, historic city of La Paz, Baja California Sur’s capital city. Stroll on the 3.5-mile Malecòn promenade along the water. You may be so entranced by the sea, and local art scene and sculpture along the way that you almost forget about food – but don’t! The fresh local cuisine at the many café’s and restaurants are too good to miss. Hey, saving sea turtles, snorkeling with sea lions and whale sharks, watching a plethora of birds and sleeping under a velvet sky, exploring the natural paradise that is Magdalena Bay, Baja California Sur, Mexico, meeting incredible people, sharing laughs is all tough – but someone has to do it. Let’s go. 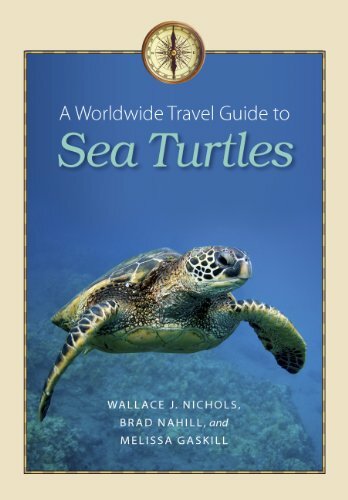 Who Should Go on Sea Turtle Volunteer Holiday? Volunteer holidays are great for almost anyone who is physically active (being an "athlete" is absolutely not necessary.) And the groups are small enough that the experience is personal. Not every itinerary is right for every person or group, but there are sea turtle volunteer holidays in different locations all year. Each incorporates opportunities for working with different sea turtle species, viewing other species and cultural and other activities as well. Treehouse glamping in the foothills of Puerto Rico’s El Yunque rainforest. Saving Sea Turtles with SEE Turtles.